This was taken on November 4, 2012 at the Albany Stratton VA Medical Center for Masonic Day with more than a few brothers and friends representing the Albany Masonic District. Lot of “care packages” were delivered to our Veterans that day to show a piece of our appreciation for their dedicated service. As always, Brother Bud Abare was the point man on this mission and he was very excited to see all of the support. Bro. Bud does this every year and it’s getting better and better. 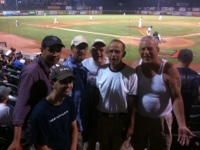 If you would like to volunteer for our Veterans please review this link Volunteer Services. I hope all of you had a happy Thanksgiving! The our lodge is hosting a Red Cross blood drive on Saturday, December 8 from 8:00 am to 12:00 noon. Please consider donating blood, and perhaps bringing your spouse, a friend or family member so that we can reach our goal of 21 units of blood donated. You can reserve a spot by calling 1-800-Red-Cross (800-733-2767) or by visiting http://www.redcrossblood.org and click on the “Make a Blood Donation” link in the blue box in the upper right hand corner. The easiest way to pull up our blood drive is to enter our sponsor code of 1862 in the appropriate box. The 31st Annual Charity Night is being held on Tuesday, October 16th, 2012 at the Albany Masonic Temple. The festivity will be open to the public. Ancient Temple Lodge F.& A.M., #14 will be donating $35,500 to numerous charities within the Albany area. Also, there will be entertainment that evening. The evening’s festivities will begin with a social reception at 6:00 p.m. followed by a Chicken Cordon Bleu dinner at 6:30. The Ella Nicholas Ft. Orange Albany No.12 will prepare a Chicken Cordon Bleu dinner with the appropriate trimmings for your discerning taste. The cost of the dinner will be $10.00 for the member and no charge for your wife or significant other. The presentation will start approximately at 7:30 p.m. Dinner reservations are a MUST. Come and enjoy an evening of fine food and entertainment. I am taking reservations; my phone number is (518) 869-6638. 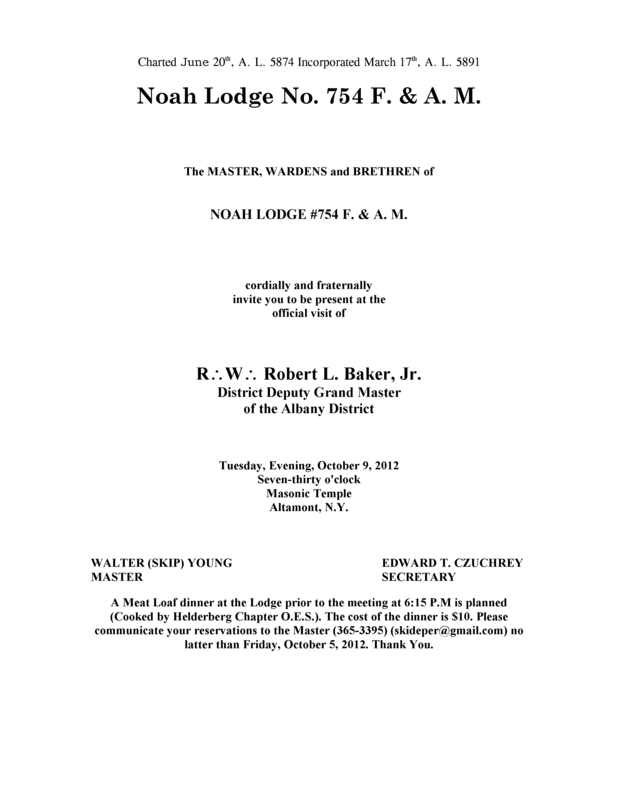 Please send your check made payable to “Ancient Temple Lodge #14 at 67 Corning Place, Albany, New York 12207 for your reservation or pay at the door. If you like to attend the dinner, please submit your reservation by October 12th. We will arrive at the MCC in Utica around 11:30 am, tour Acacia Village, then have a lunch buffet before touring Wiley Hall, The Health Pavilion, Chapel, Museum, and Library. Then, back on the bus and return to East Greenbush. We should definitely be back by 5pm. I would encourage anyone who hasn’t toured our wonderful Care Community in Utica to come join us, and bring your wives, and anyone else who may be interested. This is a free trip for us, except for a few bucks per person to tip the driver. The MCC sponsors this fully…the bus and an excellent lunch buffet. We need 40-45 people to make this work. Please email me or call and leave a voicemail with your name and how many will be attending in your party. 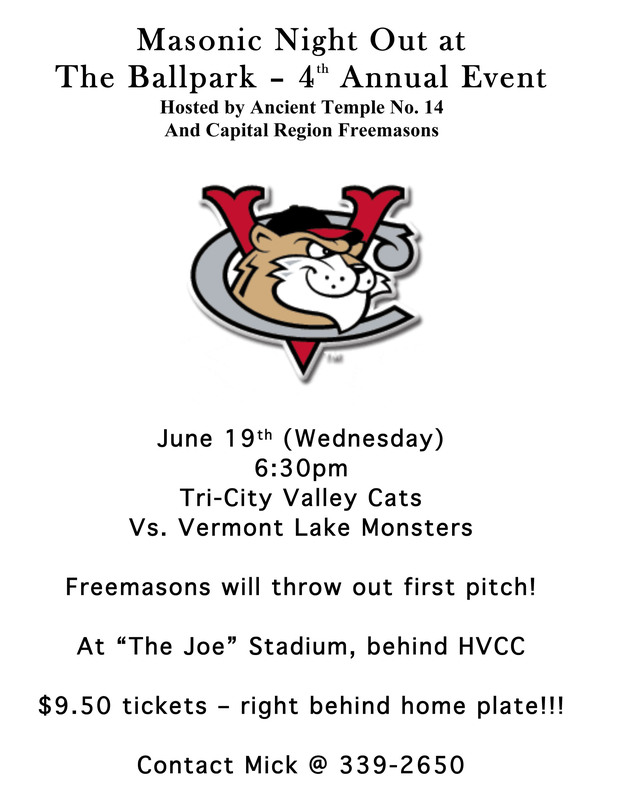 A few Brother Masons enjoying a summer night out at the ballpark watching the home city Tri-City Valley Cats play. Thank you Ancient Temple No. 14 for hosting the great event!